Golden yellow lampwork glass bead and gold pendant necklace. The borosilicate lampwork glass bead in this necklace was handmade by an American glass artist, and it was kiln annealed for strength and durability. 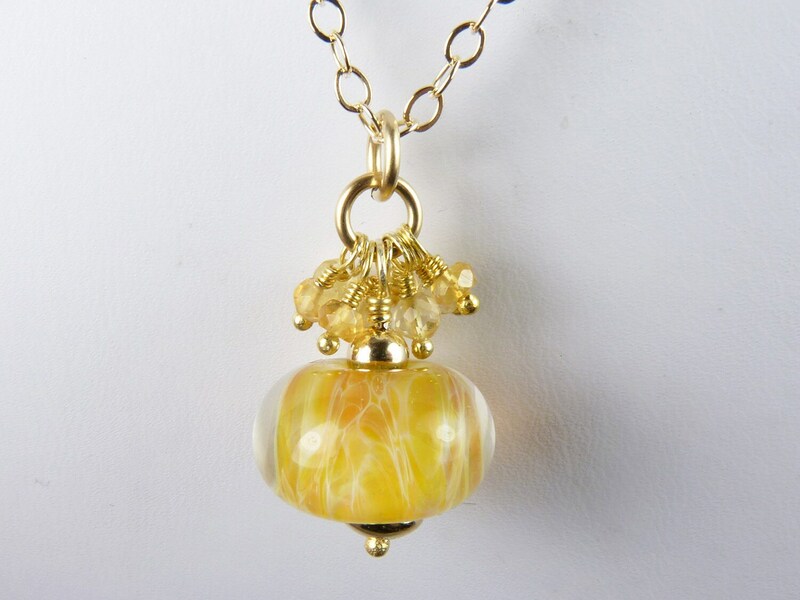 There are swirls of warm yellow and gold, and an outer layer of clear glass adds depth and sparkle. The 16mm bead rests on a 14K gold filled bicone, it is topped with a 14K gold filled bead and two 14K gold filled rings, and it is wire wrapped on a gold vermeil (gold-plated sterling silver) beaded headpin. Above the lampwork glass bead, there is a cluster of sparkly, faceted, translucent, light and dark gold citrine gems that are wire wrapped on vermeil beaded headpins. The glass bead and citrine gemstone pendant dangles 29mm (1 1/8") from a 14K gold filled chain that fastens securely with a 14K gold filled lobster claw clasp. The necklace is shown with a 17" chain in the photographs. Wearing this necklace will be like wearing your own little bit of sunshine and light! Check out all of RazzleBedazzle's lampwork glass items.